Last week on Wildlife Wednesday we talked about rhinos in general. This week let's learn a little bit about each species. There are two types of African rhinos. The White Rhino and the Black Rhino. They have 2 horns. 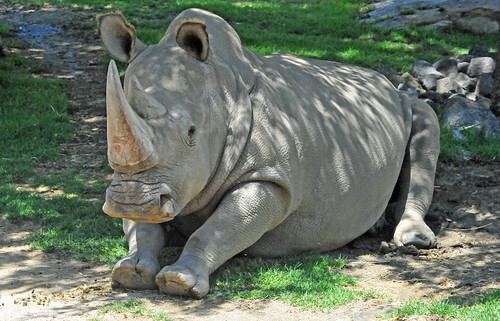 White Rhinos are the largest type of rhino. The only land animal bigger than the white rhino is the elephant. The adult white rhino (the biggest rhinos) can create up to 50 lbs of dung in one day. Rhinos use the smell of dung to help identify each other. There are 2 types of white rhinos, the Southern and the Northern. The Northern white rhino is destined for extinction. There are less than 10 in the world. There are about 20,00 Southern white rhinos, they are classified as near threatened. White rhinos have very large heads, so they spend most of their time grazing, with theirs heads down. They also have flat upper lips, better for grazing. Black rhinos have a prehensile upper lip, good for grabbing leaves. They also have smaller heads than white rhinos so it easier for them to lift their heads. Black rhinos can run up to 40 mph. Thre are about 5,000 black rhinos left in the world and are classified as critically endangered. 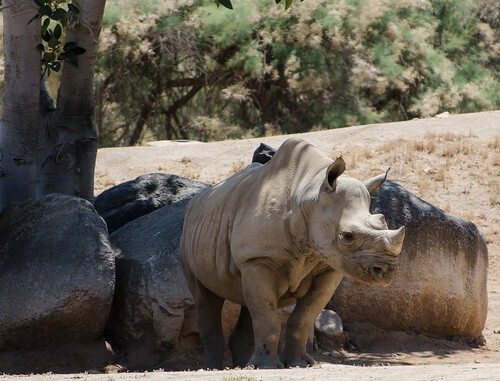 White rhinos and black rhinos are both gray. It is believed the white is a mistranslations of "'wyd'" or "weit" which mean wide. 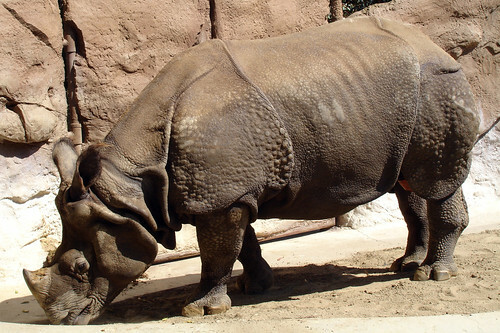 The 3 types of Asian Rhinos are the Greater One-Horned Rhino, the Sumatran Rhino and Javan Rhino. All of the Asian rhinos have prehensile upper lips and are good at swimming. The Sumatran is the only Asian Rhino with 2 horns. 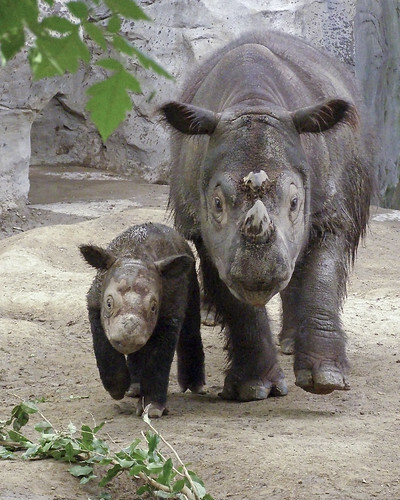 Sumatran rhinos are also the smallest rhino species. Sumatran rhinos are also called shaggy rhinos They are closest living relative to the now extinct woolly rhino. Sumatran rhino are reddish brown in color. There are less than 100 Sumatran rhinos left in the world. Javan and Greater One-Horned Rhinos have folds in their skin that make them look like they have armored plates. Greater One-Horned Rhinos are also often referred to as Indian Rhinos. They are the 2nd biggest rhino species. There about 3,000 Greater Greater One-Horned Rhinos left in the world. They are classified as vulnerable. Javan Rhinos are sometimes referred to as the Lesser One-Horned Rhino. Javan rhinos are the most critically endangered of any type of rhino. There are about 50 left in the wild. There are none in zoos.